Described below is a collection of five ancient pilgrim routes through some of the most captivating scenery in the Irish landscape which must be completed in order to obtain the Teastas Oilithreachta (pilgrim certificate) from Ballintubber Abbey. All come with well documented claims to have been used by pilgrims since ancient times and are fully waymarked. 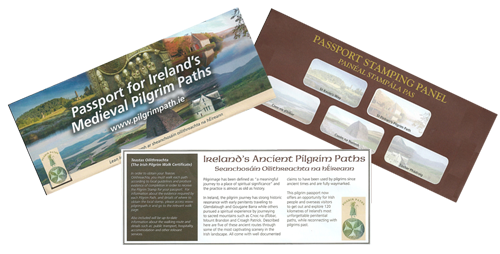 The availability for the first time of a pilgrim passport offers an additional incentive for Irish people and overseas visitors to explore some of Ireland’s most unforgettable landscapes, while reconnecting with Christian past. Camino Information Centre, St. James’s Church, James Street, Dublin. St. Kevin’s Way, Wicklow – 083 4328842 or 087 2702099 or 086 8594333. Booking: irishmountainherbs@gmail.com. Cnoc na dTobar, Kerry – skelligkerry@gmail.com, Facebook: Cnoc na d’Tobar. Below you will find walk information for each pilgrim paths along with details about the evidence of path completion that is required to obtain the pilgrim stamp. There will also be up-to-date information about the walking route along with details such as public transport, hospitality, accommodation and other relevant data. Click on the Icon for the Pilgrim Path for which you would like Passport information.